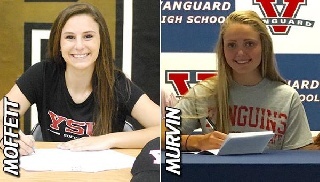 Youngstown State women's soccer head coach Fabio Boateng has announced Kylee Moffett and Larsen Murvin have signed National Letters of Intent to join the program for the 2016 season. Moffett, a goalkeeper Freedom High School, was named the FCVirginia Player of the Year in 2014 and earned first-team all-conference as a senior. During her senior year, she earned second-team all-region honors after setting the school's single-season and career records for most shutouts. As a junior, Moffett was named second-team all-conference. "Kylee is coming from a very competitive ENCL team," Boateng said. "She is quick, consistent and exhibits exceptional technique." Murvin, a defender/midfielder from Ocala, Fla., was named first-team all-county in 2016 and second-team all-county as a sophomore. Larsen is an extremely driven and competitive player every time she steps on the field," Boateng said. She is a very good technical player who has great vision with and without the ball. She is comfortable playing anywhere at the back and giving you the same results." The Penguins open the 2016 season at Robert Morris, Friday, Aug. 19, at 7 p.m.